You know how some families find homemade food such a treat? Well, growing up, we thought bought food (like cookies, granola bars, cupcakes, etc.) was the treat because we were almost exclusively fed homemade food. It's hard to imagine now, but it was true. I used to pine over the individually packed tastykake desserts my classmates had in their lunches while my mom packed homemade cookies or a piece of homemade cake wrapped in wax paper for me. It was a real special occasion when soda was served at birthday parties or when Easter and Halloween rolled around and we ate sweets out of little plastic packages and wrappers. Easter table with flowering quince. I didn't know then that my mother was protecting us from preservatives and food dyes (all the while saving our family money). What I did know and learn is that what you don't get or have very often becomes something special whether it's good for you or not. Fast forward a couple decades (or a few). I don't pine over packaged sweets anymore, but on special occasions, we buy and eat things we don't the rest of the year. For Easter, we bought a can of pineapple chunks for the pineapple sauce that went over our ham which was processed ham loaf mix formed into balls. We also bought two boxes of jello to make Raspberry Applesauce Jello Salad. 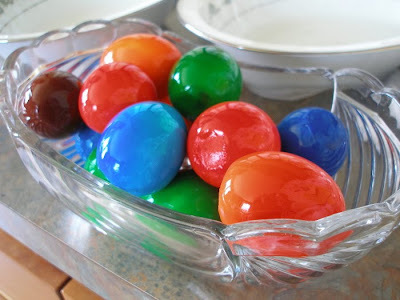 And I used copious amounts of food coloring to dye pickled eggs. Those things don't make an appearance in our shopping cart the rest of year. On special occasions, we go a little crazy. As if you don't already think I'm crazy. It's okay. I know. I'm generally not a big fan of jello or jello salads. I do remember a jello salad my Grammie used to make. You know the kind- it was layered with a crunchy pretzel bottom, some red-colored jello in the middle with a whipped cream top. It was yummy. My all-time favorite jello salad is the one I'm about to share with you. The recipe came from my Aunt Betsy, I believe, and it resembles jello salad but belongs in a class by itself. The applesauce makes it different, makes it incredible. The red raspberries kick it up a notch. Please, oh, please, make this jello salad the next time you celebrate a special occasion. I promise you'll be glad that you did. This is super easy to make. Make it the day before so it has plenty of time to set up. Dissolve two boxes of jello in the boiling water. 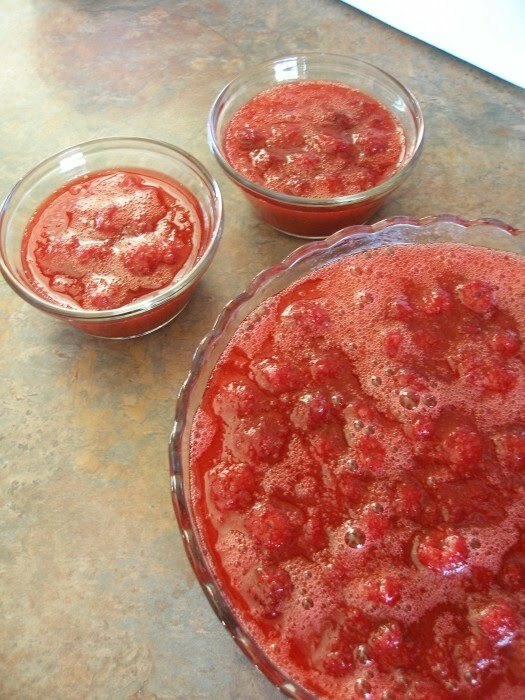 Add lemon juice, applesauce, red raspberries and cold water. Stir to combine. Pour into a jello mold or large bowl and refrigerate overnight. Oooh, that applesauce jello looks delicious! I'm not waiting for a special occasion. That's getting made this weekend! I make everything homemade! When my husband gets a craving, though, he goes out and buys canned chili beans, hot dogs, and potato chips!!! Your jello looks good! I will have to try it. Blessings!! 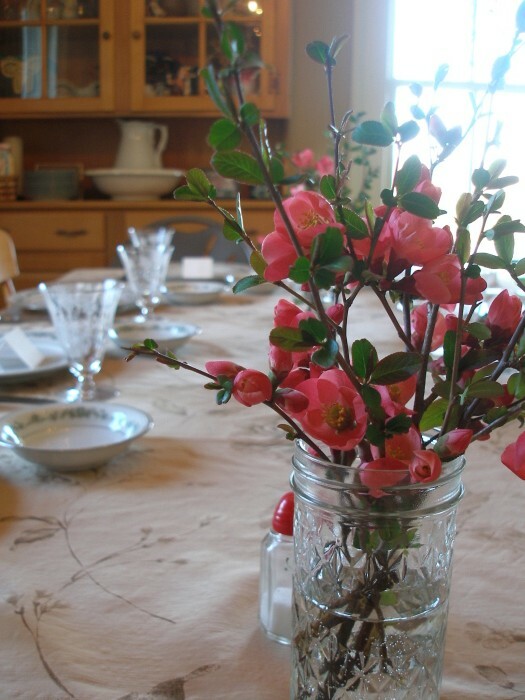 What a lovely table for Easter! So pretty and inviting! Oh those pickled eggs look great!! Did you eat them all up?? 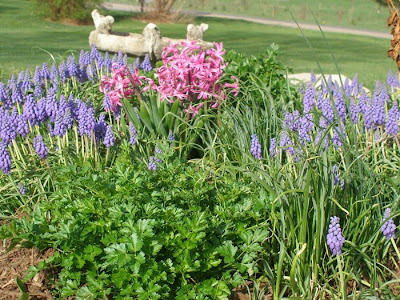 Your flower garden is beautiful. i so understand where you are coming from. We are such i want it now society that nothing is special any more. My grandmother made a version of special applesauce too. For hers, she dissolved cinnamon hearts in boiling water, added it to cherry jello, and finally to the applesauce. She called it 'Spicy Applesauce'. So yummy! And, she surprised all of us and brought it to Easter dinner this year. We hadn't had it in years. I'm definitely going to try your raspberry version. Sounds awesome. Thanks for the recommendation - I want to try yours now too. I wonder if I could use my frozen stawberries for this? I don't have any raspberries. Margo, I think strawberries would work just fine. You may want to replace the raspberry jello with strawberry-flavored. If you try it, please come back and tell us how it turned out:-). this is so true.... we still are like this.... my son asked why I made everything.... and I said "because if I didnt~ we'd be out of money" I have a son who eats amazing amounts.... and hates sugar! who would have thought!!! Totally random...I just got back from the store and had got the ingredients to make this :) Perhaps we are subconsciously wishing our bushes would hurry up and make raspberries. bclong1998, I'm not sure. The jello provides the only sweetener, so you'd need to replace that if you're plain gelatin doesn't have it. Let me know how it works if you try it:-). My grandmother served jello at every meal except breakfast! Always!